Maa Brahmacharini is the second manifestation of Maa Durga who is worshippied on the second day of Navratri. Here word “Brahm” refers to “Tapa”. So Brahmcharini means Tapa Charini – The one who perform Tapa or penance. It is Said that the “Vedas”, “Tatva” & “Tapa” are synonyms of word “Brahm”. 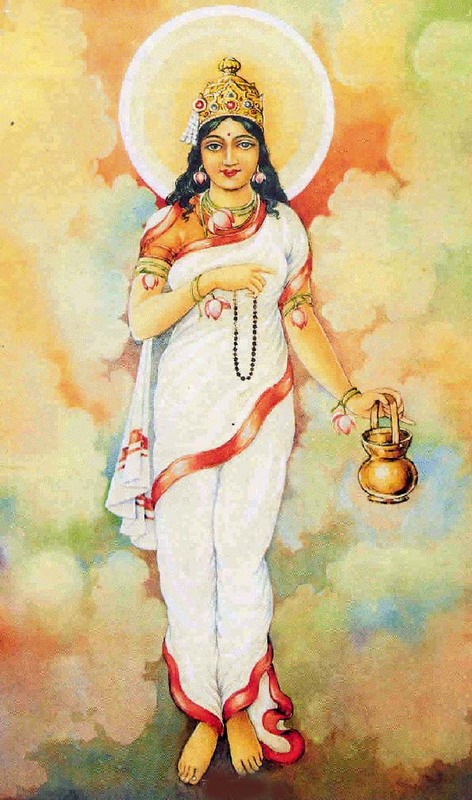 The form of Brahmacharini is tremendously effulgent and extremely majestic. She holds a rosary in her right hand and Kamandalu in her left. SHE personifies love and loyalty. Mata Bhramacharni is store-house of knowledge and wisdom. Rudraksha is HER most adorned ornament. When she was incarnated as the daughter of Himalaya, then influenced by the instructions of Devrishi Narada, she practiced very hard penances in order to obtain Lord Shiva as her divine consort. Due to her unearthly penances she was termed as Brahmacharini. She spent one thousand years, only on fruits and beet-roots. One hundred years she spent only by eating leafy vegetables. For a sufficient perfiod of time observing complete fast she suffered tormenting of nature like torrential rains and scorching sun and biting cold, under the open sky. After such a difficult routine she lived only on dry Bilva pattaras (leaves) fallen on the ground for three thousand years. She kept her engrossed for twenty-four hours in worshiping Lord Shiva. After that she gave up eating even these dry leaves. For several thousand years she went on without any food and water. Because she gave up eating dry Bilva leaves so she was known to be Aparna as one of her epithets. After the hardship of penance for several thousand years her body became extremely lean and thin. She was reduced to skeleton only. Her penance, sharpened as it was, caused great disturbance in all the three worlds. The whole universe was shaken. The Gods, the Rishis, the Siddhas, the Munis all eulogized her penance as an unprecedented virtuous action. Ultimately Lord Brahma through an oracle addressed her and said to her in a very pleasant manner-O Goddess, so far nobody has ever practiced such an austere penance. Only you could have done it. This wonderful deed is being praised in all the four quarters. Your desire would be fulfilled. You will decidedly get Lord Shiva as your divine consort. Now stop your penance and go home. Your father would be shortly coming to take you back. Brahmacharini Durga is capable of providing unending benefits. By worshiping her the person inculcates penancing, renouncing, dispassion, ethical conduct and restraint in himself. Even in the most critical periods of struggle the mind remains unshaken and he does not deviate from the path of duty. By the grace of mother Brahmacharini he gets success and victory always and everywhere. On the second day of Navratri Durga Pooja it is the Brahmacharini aspect of mother Goddess Durga that is worshipped. This way the mind of the striver moving upward is established in Swadhisthana Chakra. The Yogi, who makes his mind stay in this Chakra gets the devotion and blessings of the Goddess.